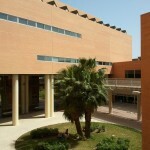 evo* will take place at the Computer Science School of the university of Málaga.The school premises are located at the Campus de Teatinos, 15 min. from Málaga downtown, 15 min. from the Airport, 10 min. from the Parque Tecnológico de Andalucía. 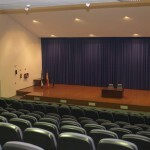 All rooms are equipped with computers, data projectors and loudspeakers. Wi-fi access would be provided for conference delegates. The School has a large cafeteria for lunches and coffee-breaks. 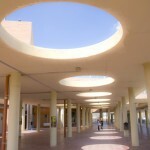 The School has an easy access from Málaga downtown by bus or taxi. The campus can be easily reached by bus. 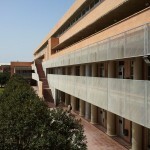 Public buses from lines 8, 20 and 22 take you to the campus from the city center (main bus stop: “Alameda Principal”). Average commuting time is about 20 minutes from the city center, and buses run every 15 minutes. Click on the map below to enlarge. 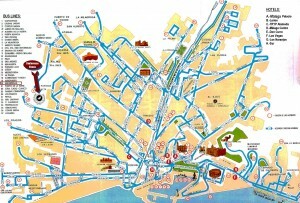 Taxis are not very expensive in Málaga, and they may become a good option to move around. The usual taxi fare for taking you from the city center to the University campus (or the other way round) is about EUR 8 (the trip takes 15 minutes aprox). In the airport, please do not trust unofficial taxi drivers that unsolicitedly offer you their services. Use the taxis available outside the airport waiting in the normal taxi lines. Taxis inside Málaga use taxi-meters for calculating the trip fare. However, trips to and from the Torremolinos have a fixed fare and do not use the taxi-meter. Please ask for the trip fare to the taxi driver before getting into the taxi, and ALWAYS ask for a receipt. All taxis should have a price list with the fares applicable to all trips, which should be clearly visible and must be explained to everybody upon request. Make clear with the taxi driver the amount of the fare before getting into the taxi. Taxi-meters should be used between the city center of Málaga and the University or the airport, since they are all considered to be inside the city limits.